Depicts the Illinois and Michigan Canal which helped establish Chicago as a transportation hub before railroads became the dominant form of transportation. 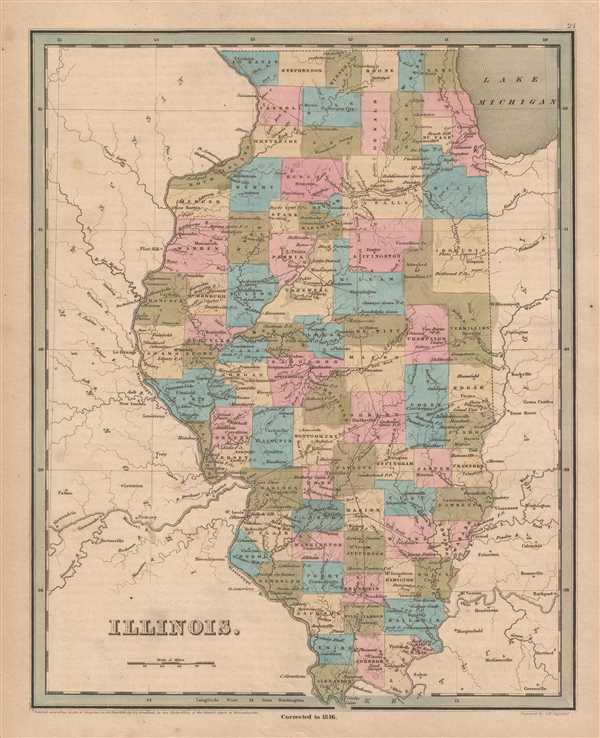 This is an 1846 Thomas G. Bradford map of Illinois. The map depicts the region from Iowa (labeled Wisconsin) and Missouri to Indiana and Kentucky and from Lake Michigan and Wisconsin to Missouri and Kentucky. Highly detailed, each county is labeled and shaded a different color for easy differentiation. Numerous cities and towns are labeled, including Chicago, Peoria, and Springfield. Several railroads and canals are illustrated, although none of the railroads are specifically named. The Illinois and Michigan Canal, simply labeled 'canal' here, connected the Great Lakes to the Mississippi River. It ran 96 miles from Chicago to the Illinois River at LaSalle-Peru and helped Chicago establish itself as a transportation hub of the United States. The canal opened in 1848, and was largely replaced by the Chicago Sanitary and Ship Canal in 1900, and ceased operation after the Illinois Waterway was completed in 1933.